Third time's the charm on this one. Not necessarily expanded, but some resequencing and improved sound and definitely improved packaging makes for this score's latest incarnation. Tried to include the vocals but wasn't possible. Rambo III re-sequenced, re-mastered, re-packaged! After lengthy delay, third and final score by Jerry Goldsmith in initial Rambo trilogy finally brings Intrada CD series under one roof at the same time. John Rambo takes on Russians in Afghanistan in effort to rescue captured Colonel Trainman. Sylvester Stallone, Richard Crenna star, John Stainier photographs, Stallone & Sheldon Lettich script, Buzz Feitshans produces, Peter MacDonald directs. 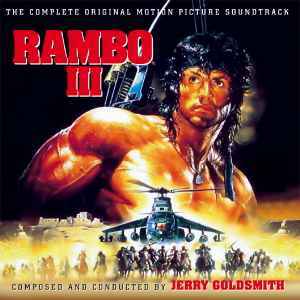 Jerry Goldsmith writes his longest Rambo score, infuses it with the largest number of thematic ideas as well. 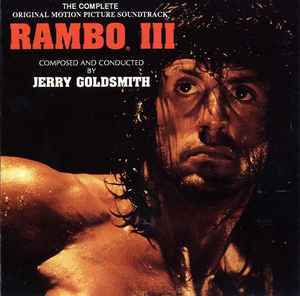 Melodies from first two films do appear but this time Goldsmith emphasizes all-new Rambo-in-action material with new rhythmic foundations as well. Also of note: Architectural device of new four-note building block that launches new theme. Motif not only anchors new Rambo theme but also opens other new material including music for Afghanistan locale plus beautiful minor-key theme underlining Rambo’s loyalty to new friends helping him in his cause. Capturing center stage none-the-less is dynamic action music wherein four-note motif in brass over familiar mixed-meter rhythms in left-hand digital piano literally propel Rambo into action. Goldsmith himself dubbed forte performance of piano overlays during mixing to create unusually commanding timbre. Post-production editing of the film created necessity to truncate numerous cues, replace others with tracks from second film. As such, CD for Rambo III features music not heard in final film. Highlights of score are numerous but standing tall is powerful ending sequence when Rambo parts with new friends, rides off in Jeep with Trautman. Here, Goldsmith returns to his very first “Homecoming” theme from movie that launched series, First Blood. As solo trumpet gives way to strings, entire orchestra crescendoes in powerful fortissimo farewell to this most emotional of Goldsmith themes. Entire following end credit music heard in same cue (“I’ll Stay”) offers magnificent medley of new action theme with haunting minor-key theme, culminating in stirring coda that melds both second and third film’s themes in single muscular flourish. Great finale to the trilogy! Intrada presents entire score from first generation three-track masters mixed by Mike Ross-Trevor from his original Otari 32-track digital scoring session elements. Previous releases were produced from two-track session DATs. New mastering adds weight, clarity. Score also now presented for the first time in film sequence. New liner notes focusing on thematic ideas plus revised packaging from Kay Marshall complete this definitive look at a genuine Goldsmith action classic! “The first time was for himself. The second was for his country. This time is for his friend.” Arthur Morton, Nancy Beach orchestrate, Jerry Goldsmith composes, conducts Hungarian State Opera Orchestra. The Goldsmith trilogy is now complete. God how do I justify buying this a 4th time. I love the score but man you’d think if they have a record seeing that a customer bought it from them twice already they’d just send the discs with improved sound. Wishful thinking of course because they are out to make money. Assuming it sold out each time, I would think the target audience is people who never bought it. Haha good point. I am such a loyal Intrada customer I think I have to buy every release. If this is a difinitive / complete remastering of Rambo III, I'll most likely bite. Who said there was anything wrong? Generally speaking they follow the same work flow as a new title, but usually it takes less research on the licensor's side and we've already located elements (or just discovered new ones) and that helps. When we tried to add the songs to RAMBO III it opened up all sorts of complications and we decided to just give the score a new mastering and redo the packaging, foregoing the songs. I lover the cover art, but the colors were so pumped up it looked cartoonish and for this new release Kay really got its original colors to shine. Well, it's extremely ugly. But it sounds like it's going to be that same art again, just color corrected. Not that I mind, mind you. There's no shortage of ugly film art out there, and while attractive cover designs are nice, I've never purchased a CD because of it, or not purchased a CD because of it. I won't be buying this new "Rambo." Quite content with the old one. But no reason it shouldn't be back out there, and given that, no reason they shouldn't tweak it if they can. Which I guess they can. Also, like MV said in another thread, re-issues are generally a license to print money. get the forthcoming, or the above helicopter cover issue. HUGE HUGE improvement in sound quality over the obsolete, initial Intrada issue. Everyone should dump that first version. I have only the initial Intrada expansion, and have never been bothered by it's sound, although I don't have the newer version to compare to.